We’d love your help. 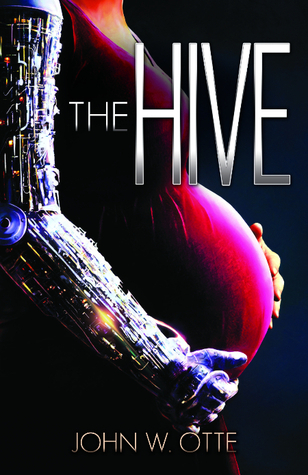 Let us know what’s wrong with this preview of The Hive by John W. Otte. To ask other readers questions about The Hive, please sign up. What about this book places it in the 'Christian' category? I'm a Christian myself and a Christian sci-fi story sounds awesome, but I'm curious about how this is a faith-related book. Age Range: 16+ for romance. Just finished this book and wow, that ending! I want the second book RIGHT NOW!!! Zain is a girl who is telepathically connected to her home, the Hive. Her brain buzzes with chatter, and it fulfills her. Suddenly, she’s ripped away from the only home she knows and her thoughts are her own. The Hive controls it’s occupants and no one cares; Zain didn’t either until she realized there was more out there. This book was very interesting! Zain had an electronic arm and that reminded me of Cinder from Marissa Meyer’s Lunar Chronicles. I could tell John Otte took a lot of time on Zain, her characteristics and home. She was a well developed character who left you concerned for her. I am really curious about Mathew/Scorn. We didn’t get to dwell in his life much as most of the story is focused on Zain and her struggles. I hope the second book shows more of his life and trials. The author gave us little bits and pieces, but not enough to put together the whole puzzle. I loved The Hive, and I am looking forward to going back into Zain and Matthew’s world. There is a part where Zain takes off her clothes for Matthew. She wear a special suit so that with a click of a button she can change her clothes and/or undress. She did it because of things she saw on the internet. This personally made me really uncomfortable, it was only about 2-3 paragraphs long and they didn’t mention it again. Sci-fi is not a genre I am often drawn to, but I enjoy Otte's writing so I thought I would give this book a try. The first two pages I was a tad intimidated and thought I might need a sci-fi-English translator. ;) However once I pushed through, I really got into the story. I enjoyed Otte's vivid descriptions and an engaging plot line that held my interest til the end and kept me up way too late the last two nights. Overall I enjoyed the character development and romantic tension in the story. De Sci-fi is not a genre I am often drawn to, but I enjoy Otte's writing so I thought I would give this book a try. The first two pages I was a tad intimidated and thought I might need a sci-fi-English translator. ;) However once I pushed through, I really got into the story. I enjoyed Otte's vivid descriptions and an engaging plot line that held my interest til the end and kept me up way too late the last two nights. Overall I enjoyed the character development and romantic tension in the story. Definitely worth reading! I also appreciated how the spiritual/faith elements were woven into the story. I often cringe at fiction from Christian authors because the spiritual elements sometimes seem cheesy or a bit awkward or forced, but in The Hive, Otte incorporates them naturally and very creatively. I had problems with this book. Most of them spawned by my high expectations and love for John Otte's Failstate series. So let's talk about the problems. My first complaint is the characters. They felt flat and I was unable to relate to them. I also felt like Zain was super... awkward to read about? Her scenes felt a bit stuttery. Zain also didn't do much action, and I just didn't connect with her at all. She needed a bit more of a backbone in my opinion. My next complaint is the world. Failstate tak I had problems with this book. My next complaint is the world. Failstate takes place in a rich world, but the Hive's world felt more like the world of Star Wars or Star Trek than an original world. Also, the pro-life element felt sort of forced, and literally nothing happens with Zain's baby. Another problem I had was the ending. I didn't like how things turned out. HOWEVER, I did like a few things. Like the Hive. They were super cool. And that cover is just stunning. Also the computer hacking stuff. And Matt. INTIMACY - There is an unneeded scene where Zain tries to show her "appreciation" for Matt's hospitality by basically offering to sleep with him. While this is my opinion, I know others have enjoyed this book. If you want to read it, go ahead. Don't discard this book just because I didn't enjoy it. This is my third John Otte book. The storyline was intriguing. We have a woman who is part of a collective. She awakens and gets separated from her hive (similar but better than The Borg). Turns out she's not only a cyborg, but she's pregnant one. Oops. Great premise. And the writing is solid. I liked the characters: Zain, Matt, and Jim especially. Of the three, I really wanted to learn more about Jim. He's a fantastic complex side character.I'd like to know more of his backstory. It's been a while This is my third John Otte book. The storyline was intriguing. We have a woman who is part of a collective. She awakens and gets separated from her hive (similar but better than The Borg). Turns out she's not only a cyborg, but she's pregnant one. Oops. It's been a while since I read Numb, which is set in the same storyworld as The Hive. I love how the politics in this series come together. The Ministrix, the Praesidium, and now The Hive. It does have a Star Trek/Star Wars feel to it, which I think is well done. Fans of either series should enjoy this book. As far as criticism goes, at times I felt like the plot tension was resolved too conveniently. Other than that, it was a well told story, and I'd like to read more from this story world. *I received an advance copy of this book in exchange for an honest review. A pregnant cyborg and a teenage boy fight against intergalactic governments to protect the unborn in this novel from Christy award winner John Otte. The Hive turned out to be one of the best books I've read this year. When I saw that the main characters were teenagers, I wondered if the book would be geared more for the YA crowd. Instead, I found a story that has a definite broad appeal. Especially with the mature topics discussed, it reads like an adult sci-fi/action/adventure novel. I was pleasantly surprised. Even if someone was not usually a sci-fi fan, I think they would enjoy this book thoroughly. The technical jargon wasn't too much, the world it is set in not too difficult to understand, and the governing bodies especially were easily relatable to the real world, the church specifically. There were some interesting parallels drawn. Though it is technically a sequel, one doesn't have to read Numb before reading The Hive. It is a stand alone novel. The characters were well developed, and I found myself easily drawn into their world. While Zain and Scorn definitely learn some lessons on their journey, it doesn't come off as preachy or unbelievable. It made me want to read more, so I'm hoping for a sequel! I've added Numb to my reading list as well. I would recommend The Hive without hesitation. I actually think it would be a great first sci-fi/space opera read for someone. It stays firmly within the genre without being too heavy handed. Her ship was no longer functioning. It's last act was giving her the means to survive and escape. But when she was disconnected from the Hive (a cybernetically enhanced society) and isolated with her own thoughts she discovered a disturbing and perplexing truth. Zain was pregnant - but why or how was not information she could access. A fragmented, corrupted file gave her a clue, a single name - Scorn. Is this Scorn a way back to her people? Zain is determined to track down this lead, but the world outside the Hive is something she has never experienced. And Zain is about to get a sudden and confusing crash course on the Ministrix, the Praesidium, and humanity in general. Matthew Nelson (aka Scorn) is known for his skills in the unseen realms of the cyber world. If you've been hacked Scorn or his friends are probably involved in it. But Scorn is determined to leave this life behind, and hopefully before he gets caught up in a game that becomes even more dangerous. But one of his games had an unexpected result and he is about to be visited by this mistake. It was all a little harmless fun, until he had to face the results of his fun. And now his life and the life of Zain and her unborn child are on the line as well. Can they find a safe haven until they can plan their next step? What follows is a chase with Zain and Scorn as persons of interest and if they aren't careful they may find themselves at the mercy of the Praesidium, the Ministrix, and anyone interested in the possible reward being offered. The Hive is the second book in The Ministrix series. If you haven't read the first book (Numb) yet don't worry this book can stand alone so you can go back and read the first one next. Fans of Science fiction will enjoy the science elements woven throughout. If you enjoy Dystopian, Star Trek, and Star Wars give this book, this series a try - I think you will be well pleased with your experience. But a word of warning don't let the Ministrix or the Praesidium know that you've glimpsed some of their closely guarded secrets - you may not enjoy the experience when they discover your whereabouts. And they will discover you if you divulge what you've discovered. The Hive deals with (at least on some level) the idea of whether or not a child can be born an accident and then if the child can be aborted for the mother's benefit. It is a great theme, especially with the social issues in America today. Tangled with this was also the idea of taking responsibility for our actions and looking out for more than just ourselves. While I think that these themes could have been explored more, I still enjoyed reading about something pertinent to modern culture even The Hive deals with (at least on some level) the idea of whether or not a child can be born an accident and then if the child can be aborted for the mother's benefit. It is a great theme, especially with the social issues in America today. Tangled with this was also the idea of taking responsibility for our actions and looking out for more than just ourselves. While I think that these themes could have been explored more, I still enjoyed reading about something pertinent to modern culture even if set in the future. My one true complaint was that I felt Zain's solution to their problem came about a little too easy. I thought it would have taken a bit more effort, especially after the ordeal Mat and the others had just gone through for her. Maybe if she had contemplated this solution before, I would have found it more believable. That said, I loved the intricacies of the politics Otte has created for his world, as well has his use of a hive to symbolize the way Christianity should work. With everyone working to the greater good it the Kingdom, supporting and helping each other without question, but with the freewill to chose. I hope to see a sequel coming soon, or else another stand alone in this world. Science fiction and political intrigue, what's not to like? I read the first book in the series, Numb, when it came out, and I was excited that there was a second book releasing! That being said, you don't have to read Numb first, as The Hive can stand alone. I was a bit worried that a book with two such young main characters might not appeal to a reader in her mid-thirties. Turns out, there was nothing to worry about, as I still greatly enjoyed reading The Hive! There are definitely strong Chris Science fiction and political intrigue, what's not to like? I read the first book in the series, Numb, when it came out, and I was excited that there was a second book releasing! That being said, you don't have to read Numb first, as The Hive can stand alone. There are definitely strong Christian themes throughout the book, and John Otte did a great job integrating that into the story. So, it doesn't feel like a sci-fi book with a bit of Bible tacked on as an afterthought. I was slightly disappointed that the only thing in common with Numb was that both stories took place in the same galaxy. Still, it's possible that additional books in the series will end up tying threads from both stories together. What happens when there’s a fight between the home you’ve known and the truth you discover? Is safety worth giving up the most precious things in life? And what are those things? These are questions The Hive explores from the very start. They carry through to touch everyone that we encounter. The Hive is most certainly a morality play set among the stars. But it’s not at all a heavy-handed one. John Otte does a wonderful job allowing readers to empathize with the characters without drowning us in What happens when there’s a fight between the home you’ve known and the truth you discover? Is safety worth giving up the most precious things in life? And what are those things? These are questions The Hive explores from the very start. They carry through to touch everyone that we encounter. The Hive is most certainly a morality play set among the stars. But it’s not at all a heavy-handed one. John Otte does a wonderful job allowing readers to empathize with the characters without drowning us in their emotions. Zayn, Scorn, and the rest of the cast were fun to get to know. It’s been quite a while since I laughed – and cried – with a character to the degree I did throughout this novel. A great deal of futuristic technology is mentioned throughout The Hive. But not all of it is well explained. That, really, is my only criticism. A hugely fun book with an serious undertone. Zain is part of a collective consciousness called 'the Hive'. She's a cyborg. And somehow, mysteriously, she's pregnant. Occasionally the Hive rent a womb for paying customers outside their tightly-controlled region of the universe - for couples in the Ministrix or individuals in the Praesidium, other just-as-tightly-controlled intergalatic governments. But these tailor-made children are always implanted in breeders, never in an teenage engineering cy A hugely fun book with an serious undertone. Zain is part of a collective consciousness called 'the Hive'. She's a cyborg. And somehow, mysteriously, she's pregnant. Occasionally the Hive rent a womb for paying customers outside their tightly-controlled region of the universe - for couples in the Ministrix or individuals in the Praesidium, other just-as-tightly-controlled intergalatic governments. But these tailor-made children are always implanted in breeders, never in an teenage engineering cyborg like Zain. The spaceship she is on has a critical malfunction and, as she escapes, she finds herself outside the range of the Hive. Every effort to return only takes her further from her goal. Eventually she realises the only clue she has to finding her way home is that someone named 'Scorn' ordered a child. It follows therefore that this Scorn person knows how to contact the Hive, even if he does happen to reside in the Praesidium. Matthew Nelson is horrified when Zain arrives on his doorstep, claiming he ordered a child. He's just managed to get rid of three of his bullying school friends by hacking into the Praesidium's system and getting them called up for military service. Temporarily, of course. Just to teach them a lesson. But things are going seriously wrong in Matthew's life. He's meddled in cyber-systems he would best have left alone. And now both he and Zain are targets. Rating: PG Some thematic elements involving a teen pregnancy. Zain belongs to a Hive of Cyborgs and finds herself suddenly separated from them. As if this wasn't bad enough for her, she also discovers that she is pregnant and doesn't know how or why. To answer these questions, Zain goes on a journey that leads her to space stations and worlds, encountering people of the ugly, cruel, and kind variety, all the while hoping she can save her baby and also return to The Hive, her home. I enjoyed this Rating: PG Some thematic elements involving a teen pregnancy. I enjoyed this book. Generally, as a rule, I don't like too much sci-fi, but I suppose my exposure to a lot of Star Trek series helped my understanding some when details of computer/space ship/cyborg tech talk came up in the story. And Otte kept the tech talk sort of simple enough for me to follow. When it seemed I couldn't read anymore, the tech talk came to a stop. Tension among the interesting characters kept the story going at a steady pace. A page turner for me, and I don't often find enough of those kinds of books anymore. There was so much to love about this book. Zain and Matthew are interesting characters. Zain is a cyborg and a pregnant teen. She's also a mechanic. Matthew is a average Joe high school student who happens to be a master hacker. He's not overly likable at first, which actually makes him more endearing as the story progresses. There's a lot of action and the story is well-paced. The end was a bit rushed but satisfying. John Otte describes himself as the writer of "unusual stories of geeky grace" and The Hive delivers. As the mother of a couple of avid readers, I'm always looking for compelling Sci Fi with a spiritual thread that engages the reader in compelling explorations of faith. The Hive takes us on that journey in a cool futuristic setting. It's a fun read and worth the ride. BTW, I received an advance copy of this book in exchange for an honest review.